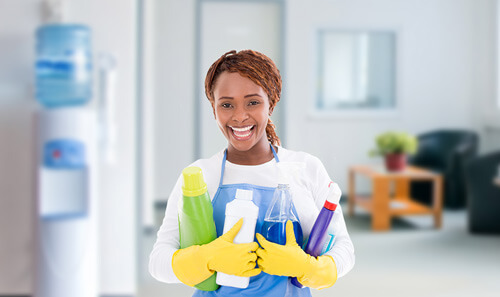 Kempston Cleaning Services offer professional, day to day maintenance and once-off cleaning service solutions to the commercial industry throughout South Africa. If you live in one of the below listed South African cities and are in need of having your office, warehouse, factory, school, restaurant or similar cleaned, contact Kempston Cleaning Services in the details provided below. Every workplace needs a good clean and, depending on the industry, some may need it more often than not. Cleaning services can be anything from bathroom cleaning & maintenance, deep cleaning of kitchens, deep cleaning of carpets, pest control, window cleaning and the list goes on. If you contact Kempston, we will be able to conduct a full checklist of your commercial cleaning needs and provide you with the comprehensive cleaning package that will make your business shine. If you are looking for a new cleaning company to take the hygiene hassle away from you, contact Kempston on the details provided below. East London Tel: 043 707 1817 Offices: 47 Fleet Street, Quigney Beach, East London, 5241 Johannesburg Tel: 011 970 3250 Offices: 4 Forge Road, Spartan, Kempton Park, Johannesburg. Cape Town Tel: 086 111 1739 Offices: 15 Dacres Avenue, Epping Industrial 2, Cape Town. Durban Tel: 031 700 8670 Offices: 26 Richmond Road, Westmead, Pinetown. Port Elizabeth Tel: 041 501 7400 Offices: 48 Albert Road, Walmer, Port Elizabeth.